i cant believe how fast the year has gone. but is something good, time keeps going and one keeps learning. i finished various commissions already (the once i mentioned in the last post) but i wont be uploading some photos of those for a while, the anime characters will be part of a contest, so i been asked to not show them before that date. With Christmas and new year approaching i think i wont be able to work in to many things, but ill try. ill be finishing a couple of commissions (a plushie and some artwork) and maybe ill get more work to do. Also, ill be working on some stuff for my Etsy shop, some "sockadillos", some little fox-like creature that you may have seen before in my flickr, some bats and a few more things... maybe some aceos i´m already working in. well, ill try to work as much as i can these days. also ill be adding some more links to the side menus, those are pages i really like with nice info or resources, or from artist i really like and admire. hope your having some good time. 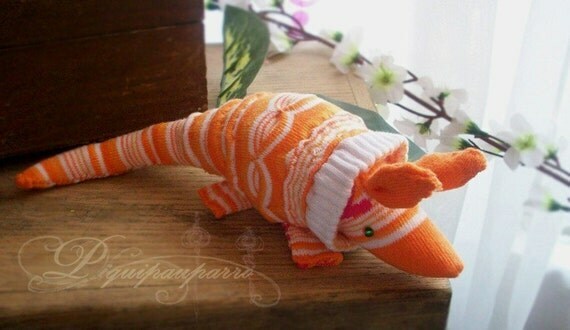 I think your sockadillo may be the cutest thing I have ever seen. Sock monkeys will no longer suffice!